Save up to 40%, why not try? A highly fitting addition to Johnson & Johnson's best-selling Acuvue range, 1 Day Acuvue TruEye are daily disposables that have been designed to make wearing contact lenses a more comfortable and freeing experience. 1 Day Acuvue TruEye are made from silicone hydrogel, providing highly comfortable lenses that keep eyes fresher for longer. 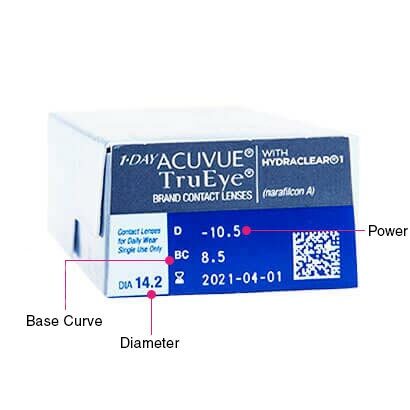 Where these lenses differ from 1 Day Acuvue Moist is that the silicone hydrogel material allows more oxygen through the lens and to reach your eye. As a result, eyes are kept fresh and comfortable all day long. Hydraclear® 1 technology has been used in the design of these lenses and helps to retain moisture. In turn, this hydrates the eyes, preventing them from drying as the day goes by. Ideal for office workers, or anyone who uses digital devices frequently, these contacts keep your eyes feeling fresh from morning till night. Slim and lightweight, Acuvue TruEye lenses will make you feel like you’re not even wearing contacts, as the increased flow of oxygen ensures irritation and dry eyes are a thing of the past. You can also buy 1 Day Acuvue TruEye contact lenses in a larger 90-pack supply, meaning you’ll save even more money and won’t have to reorder for at least 3 months. Comfortable - you almost don’t feel you’re wearing contact lenses. Perfect for me. Have been using this product for some years now and happy to continue. Would highly recommend. Can’t believe you can get more comfortable lenses than these. Just remember to take them out at night as they won’t remind you. Very comfortable, stays moist over the length of the day. Mostly good, keeps my eyes moist but things to tend to stick to the contact. Quality lenses for my eyes ( the only pair I will have). Nuff said. Nice and comfortable for long periods, used them since they were released. A few misshaped lenses every now and then. About time they came down in price tho. Love my lenses and the price isn''t too bad either! Won''t go anywhere else. Great lenses and very comfortable. These are really comfy. Best lenses for me. GOOD SERVICE. QUICK SHIPPING TO THE USA (ARIZONA)...ABOUT 10 DAYS. MY SON LIKES THESE CONTACTS VERY MUCH. So comfortable, best lenses I have worn. The most comfortable contacts I've used. A very comfortable lens, that provides moisture to dry eyes. Very good quality contact lenses at a reasonable price. Super fast delivery, thank you! I was using 1 Day Acuvue Moist before, but they would dry out and become uncomfortable by late afternoon, so I ended up only wearing them at the weekends. Having recently switched to 1 Day Acuvue TruEye, I can now work all day in front of a monitor, whilst sat under an air-con unit and have no discomfort at all - Brilliant! The best contacts for me. I don't feel them in my eyes at all. Quality product - very comfortable to wear as you don''t feel them (some lenses feel very gummy in the eye. They also stay moist all day so no dry eyes to deal with! Just changed to these from the 1 Day Accuvue Moist as I was having problems with them rolling up / drying out. TruEye much better, last all day without rolling up/deforming. I think the Moist are just too thin. Very comfortable to use and excellent value for money. Great product. Comfortable to wear and easy is packaging to open. I love these lenses as they give me more oxygen than other cheaper lenses. Great for people that were contacts every day! Always comfortable to wear all day. Great contact lenses. They do not get dry and are easy to put on. I have tried many different contact lenses brands over the years and I have to say that these are by far most comfortable. Not the cheapest, I admit, but in my opinion, well worth the money. I have used this product for years without any problems. More expensive that some but worth the extra. Very comfortable lenses, wear them for at least 14 hours a day 7 days a week no problem. Best lenses I''ve ever worn - tried more expensive ones, but have always found these ones fit the bill. These work really well for me. I wear them most days for an extended time - approx. 15-16 hours and have absolutely no issues with comfort or dryness. I''ve even mistakenly fallen asleep on a long-haul flight to Australia and woken up, replaced them with a new set and continued as if nothing had happened, without any discomfort. Obviously not recommended but I felt no ill effects. A little more expensive but given the very high water content and flexibility they avail, I''m happy to pay the premium. I have been using this service for years. It is fast, and reliable. As I have been buying my lenses for many years I do not know if the prices are competitive. Would highly recommend. Another good factor is that if you have a problem with your order you can phone up and speak to a '' human being'' ! Excellent comfort and having used them for two or three years no problems at all. I get the monthly Acuvue from my optician and buy the dailies for holidays, weekends away, nights out, etc. They are very comfortable and save on the hassle of taking solutions away with you. Will be buying again. Good consistent service. Lenses are as expected from this major barns and cheaper from this company. These lenses are fantastic, they feel comfortable all day long, and don''t dry out. Far superior to the 1 day Acuvue Moist. Acuvue Trueye Lenses are by far the most comfortable I have ever worn ! I mean to remove them early evening to rest my eyes - but they are so comfortable most nights I forget until Bedtime! have been using theses contacts for a good few years now and they are great for me. Really comfortable lenses with great clarity. The best daily contact lenses on the market! These don''t dry my eyes out as other contact lens brands have done in the past. Good value for money, too. I always order these as they''re the most breathable for my eyes. I wear my lenses for a very high number of hours and have tried a few different types before but these are definitely the best. Great, quick service. Would recommend. The best contact lenses I have worn ?? Have used these for a couple of years now and are great lenses. Eyes do get dry after a full day wearing them, but to be expected with any contact lenses. I have been using these for years now, having tried quite a few other daily contacts (including Acuvue Moist and dailies from other brands). These are most comfortable, even after almost 18 hours in (even in air conditioning). I have tried a few samples from other brands but haven''t yet come across another that has the same level of comfort as this one. V good and efficient service. I bought these disposable lenses as I was going on holiday and didn''t want to take solutions etc. It was much easier being able to throw them away and always having lots of spares. (I also managed to take one out to clean and put it back in.) Will order again. Very comfortable daily disposable lenses; have used for the past five years with no issues at all. Great comfort. Wear all day every day. More expensive than others but worth every penny. No problems with these lenses. My optician checks my eyes every year and all is well. So light I forgot I had them in. Timely delivery and good product! If you''ve always used water-based lenses, give these a shot one month. You''ll be pleasantly surprised at how more comfortable they are...even if you never previosuly noticed discomfort! A fantastic daily contact lense that is comfortable to wear and easy to apply. Prompt delivery, easy ordering, good prices. Would recommend. Great contact lenses, do not dry out and feel comfortable all day. At a recent eye check my opthamologist was impressed at the condition of my eyes given that I wear contact lenses everyday. If you wear them every day then I would look at a good quality brand like this one. I have been using these for several years now, They are good lenses and help with dryness. As expected - have used them before. They always come on time and they are really good. I wouldn''t hesitate to recommend to fellow contact lens wearers. These lenses, although more expensive that some of the other daily lenses, are very comfortable (don''t even know I have them in) and although maximum oxygen to your eyes. Very comfortable lenses. They have to be the best daily lenses in the market. Tried these out but eyes feel more tired after wearing over 12 hours, compared to my previous Focus Dailes. Very good, quick delivery, no complaints! Love these lenses. I have sensitive eyes but have no problem wearing these. The best fit for my eyes. Use these as a daily option if using my normal monthly lenses (PureVision) are cumbersome when travelling. Very comfortable. Consistently cheaper than other online suppliers whenever I shop around with super fast dispatch times....even at weekends! Fantastic lenses and well worth the little extra you pay! Good quality fast delivery and reliable. Pretty good contact lenses but can only have them in for max 6 hours as they make my eyes dry. Really good lenses, very breathable! Lovely all day comfort with these contact lenses. Had trouble with previous brands ''breaking up'' whilst wearing them which caused great difficulty removing them, but so far no trouble with 1 Day Acuvue TruEye. the delivery was really quick,there is a great variety of products. The website is very user friendly! I definitely recommend it! exellent shop and contact lenses!!!!!!!!!! 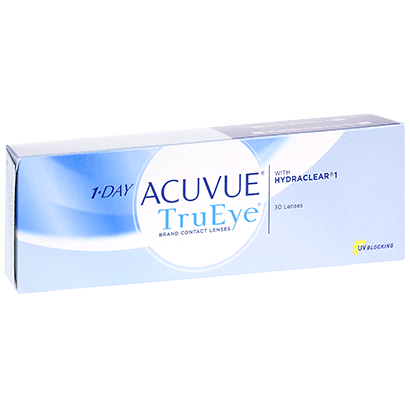 I have been using AcuVue True Eyes for several years now, a great lens which is the most comfortable and doesn''t dry my eyes as much as other brands. I have dry eyes and struggle to wear other brands, but these are comfortable for many hours! Great product. I have used Acuvue TruEye lenses for several years now and have no problems whatsoever. They are durable and very easy to apply. Comfortable lenses, definately recommend ! They are very comfortable to wear. I have been using True Eyes for many years. Highly recommended! These contact lenses are very comfortable. Moved to these from Focus Dailies. Clearer vision. I''ve had no problems at all with these lenses very comfortable to wear and a good price. Best lenses and I have tried lots over the last couple of decades. excellent product have used for years and never been disappointed with the quality of the lenses. I find Acuvue TruEye the best and most comfortable contact lenses. These contacts are very comfortable - don''t even know I''m wearing them. Best daily lenses ever used.So comfortable to wear. Not cheap, but the best on the market. Very comfortable contact lenses. Would definitely recommend to others. Very good lenses - easy to apply and use. Fantastic lenses, cannot feel you have them in. I have tried various other contacts but these I find are the best that suits me. I would recommend to any to try these. Very confortable lenses I can wear all day even if my eyes are dry. Perfect lenses, never had a problem and wear these in total comfort. I have used these for several years. I completely forget I''m wearing them! I couldn''t live without these contact lenses. Most comfy contacts I''ve used - can''t even tell they''re in! An excellent lens, very comfortable to wear all day, a very competitively priced genuine product. This is the one that I recommend if you want to wear contact lenses comfortably for long hours. Excellent product and excellent supplier! Quick and Easy. Delivered next day and reasonably priced. The most comfortable lenses I''ve ever used. 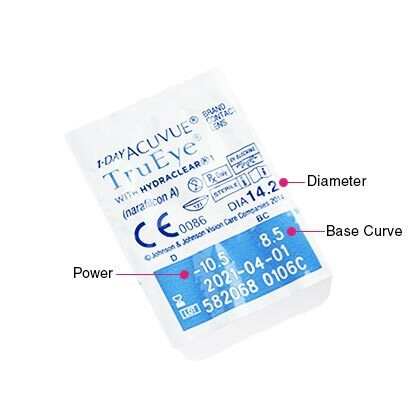 I''ve tried different ones over time but have always gone back with TruEye. Top quality lens, effective, comfortable and durable - just exactly what I need on a busy day..
Have used these for a few years now and have no complaints. Don''t ever feel like they are drying out and are do comfortable to wear. 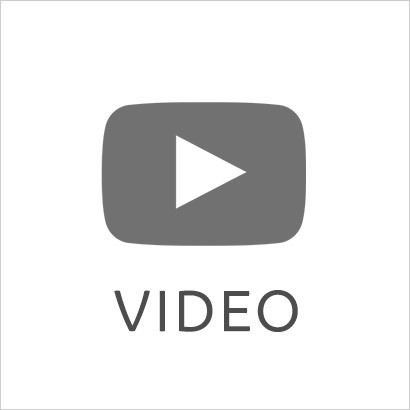 Excellent product, have used for several years. Happy to pay slightly more for the quality. These are a little dated now in terms of technology, however the fit for me is the best out there at the moment. There are better contacts on the market that stay moist for longer but for fit these work for me. I am an older lens user and I find these very comfortable all day long. Also an excellent choice if you are on holiday, it saves packing any solutions - can''t think why I didn''t wear these years ago! this product is used by my daughter and this is the only type she would wear. She loves them. I get dry eyes so many lenses haven''t been suitable for me but I jave found that the trueye lenses work for me. The only lenses I''ve worn that don''t feel like you have something in your eyes! The best for my eyes, as I have dry eyes I never got itchy or irritating feeling with true eye contact lenses. I have been using these lenses for 3 years now. Great product! First class daily wear, comfortable throughout the day. Awesome lenses, can''t get better. Have to maybe use more than two lenses occasionally as they sometimes roll up! These contact lenses do exactly what they should and as soon as I put them in I can''t feel them for the whole rest of the day. Good robust packaging too. Great lenses, no discomfort. I use every day and never have any problems with them. Take the odd day off just in case, though. Real deal. Very good lenses. I used to use Johnson''s moist contact lenses as I have dry eyes but found these uncomfortable after a few hours. Swapped to these lenses and they''re so much better for dry eyes, can wear all day comfortably. Brilliant Moist comfortable all day Contact Lenses, Brilliant. Excellent service good quality lenses at resonance price. I will definitely order again. Very comfortable and doesn''t dry out eyes. Super quality and great value of contact lenses. Comfortable to wear. I tried these as an alternative to my usual Clariti. I''m alternating the brands currently but happy so far, though I''m leaning towards Clariti for all-day comfort. they''re good but way too expensive. also annoying that they sometimes come inside out so you have to fiddle with them to get them the right way, which then significantly increases the chance of them getting dirt on them, which can cause wasted lenses. Excellent lenses. Very comfortable. I have tried others and these are the best. Excellent product, particularly easy to place in eye and remove. All good! Lenses are comfortable and are just the job! Have tried a variety of silicon-hydrogel lenses and these are the most comfortable by miles. Great product and consistent standard. Very fast and efficient - delivery within 18 hours! Thanks! I have tried other brands which are as good but always return to these lens, also the opticians agree these are good. Easy to use, flexible but also don''t feel too flimsy! Can''t tell I have them in although I can see! Always last the full day. Great quality and lasts full day and beyond for wearing during extended periods and big nights out. Hardly feels like your wearing lenses at all! I frequently drive long distances in Europe and find these lenses to be so comfortable I can''t honestly tell that I have lenses in. My vision is crystal clear even after the occasional 15 minute power naps! Been using for over 10 years .. And have very healthy eyes !! Extremely comfortable to wear .. So you tend to keep them in longer. The best lenses you can buy. Hassle free ordering. Fast delivery. great range of products. Best lenses I have used to date. I''ve been using for a long time. Good quality. Comfortable lenses and always delivered within the specified time. The service provided is always efficient and reliable. I''ve always used these contact lenses- they are the best for dry eyes. Sometimes if I wear them for long hours I will use eye drops as well but usually they are fine. I have been ordering these contact lenses for years now and I am very happy with it. Johnson & Johnson Acuvue TruEye are the best daily lenses I have worn, because of the high oxygen levels they permit. Mt optician recommended them. They are definitely one of the best lenses on the market, I wear them nearly everyday, over 8 hours a day, they never get dry. Amazing product. I have tried various dailies, which worked out to be more expensive as I had to change them a few times a day... I must say I found the TruEye most comfortable and well worth the price. I use these lenses because they have been prescribed by my optometrist. Great product easy to use would recommend them. Generally satisfied although I always get at least one defective lens per box! Please don''t doubt. I''ve been buying from feel good contacts for over a year & can''t fault them! I really liked the product that I bought and recommend. These are fantastic lenses. They feel like they are good quality, easy to put in and hold their shape and feel comfortable all day long (I wear them all day every day). They don''t cause eyes to get sore or dry and I think the amount of oxygen reaching the eye is good as the little red vessels noticeable in the whites of my eyes years ago have gradually gone since switching to tru eye some years ago. Highly recommend. Great for dry eyes, keeps moisture throughout day. TruEye are the best lenes I have used, I do suffer from dry eyes, but these lenes really help. I think they''re the best on the market! Fine lenses; comfortable, keep hydrated all day. Good stuff! A great service. The order was received within 2 days. I would certainly recommend them to my friends. Perfect for all-day wearing, my eyes never feel fatigued. An excellent product altogether. Great product. Nice fitting and comfortable. I love these contact lenses as they are extremely comfortable. I have tried a few others but they don''t match up to 1 Day Acuvue TruEye. The best I have ever had, the lenses are lovely and moist, you can wear them all day with no irritation. I''ve tried all the cheaper ones and nothing compares. Love these lenses, very comfortable for wearing all day. I have been wearing these lens for a long time,I find them really comfortable and my eyes never feel dry or tired. Nice product and soothing to the eye.